Many of funders are already committed to evaluation as a tool to improve their programs and strategies, and are seeking ways to engage in this learning process in partnership with grantees. One critical aspect of understanding and growing the impact of grantmaking dollars is supporting the capacity of grantees to assess their progress and adopt a learning for improvement mindset. Many nonprofits already collect and analyze data on program performance and hope to develop more comprehensive learning agendas. However, the nonprofit sector continues to wrestle with finding the resources, time and space to take evaluation to its full potential. This Smarter Grantmaking Playbook piece offers grantmakers ideas for how to provide evaluation capacity support more effectively. Copyright 2015 Grantmakers for Effective Organizations. 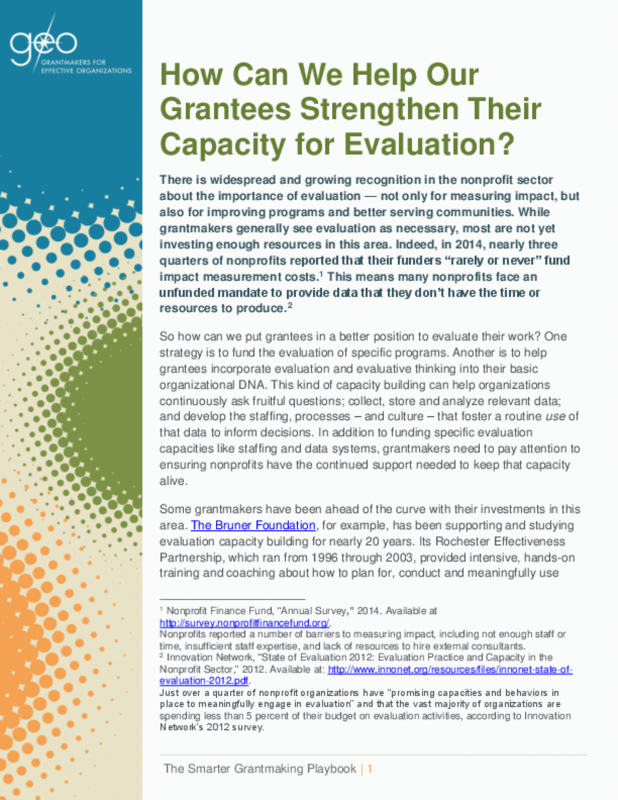 Title: How Can We Help Our Grantees Strengthen Their Capacity for Evaluation?